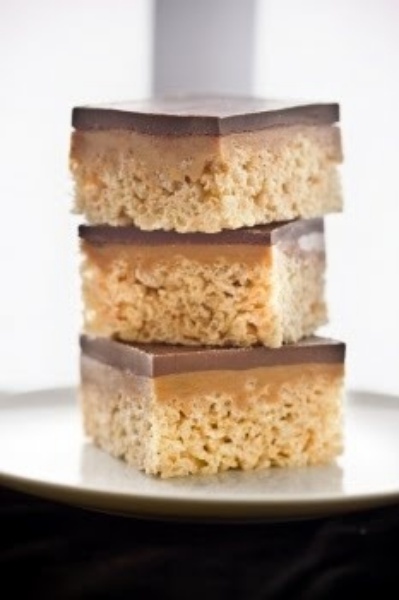 Chocolate, Caramel Peanut-Butter Rice Krispies Treats - Crunchy rice krispie treats with chocolate, caramel and peanut butter. A deliciously SWEET TREAT! Butter a 9- bX 13-inch pan and butter the pot and utensils you will be using to melt the marshmallows. Add 3 tablespoons of butter and the marshmallows in a saucepan and cook over medium heat, stirring often, until melted. When completely melted and smooth, stir in the vanilla. Turn off heat and stir in cereal until completely coated; the mixture will be sticky.